Your time in prison can be used as an opportunity to become more educated, increase your knowledge, and improve your chances of living a successful life once you are released. Your time in prison can be used as an opportunity to become more educated, increase your knowledge, and improve your chances of living a successful life once you are released. Studies have shown that reincarceration rates for inmates that enrol in prison education programs are 46 percent lower than for non-participants. 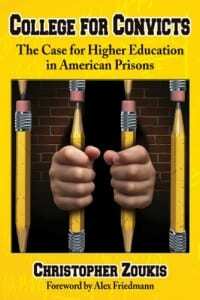 Getting an education in prison is possible. As a case in point, one of our firm members earned an MBA while in prison. We will advise you of the educational programs and opportunities available at your local prison facility, along with explaining the various correspondence education courses available to you. Within this discussion we can also help you select the most appropriate path to educational advancement, assist in choosing a quality correspondence program, and troubleshoot if any issues arise. Contact us for more information on education consultations or other areas of prisoner support. You can also buy a copy of the Prison Education Guide to learn more about correspondence programs for prisoners, or visit prisoneducation.com for specific information and resources about prison education, including the various correspondence schools available to prisoners.